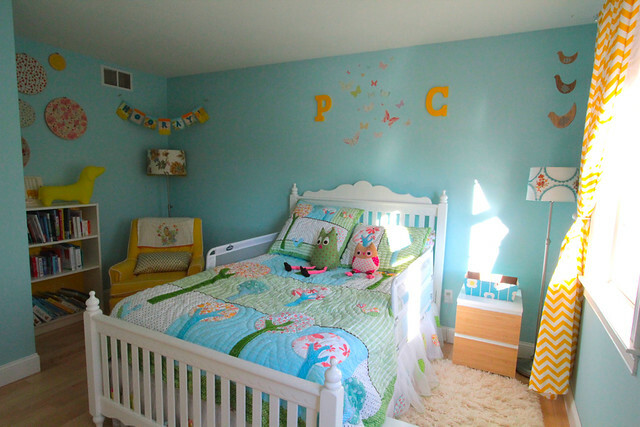 We finally finished up with Paige's new big girl room! Phew! We took all the elements that were in her nursery and transferred them over to this new space and changed up the bed, dresser, and bookcase. 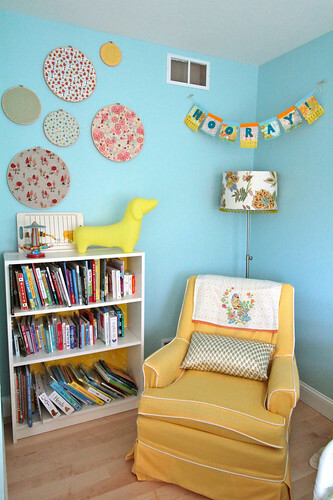 Her nursery furniture and old room now will belong to Baby N. We're working on his room now! -As you can see, we added a nightstand (Ikea) and added seagrass wallpaper to the front of the drawers to add a little something extra to the look. 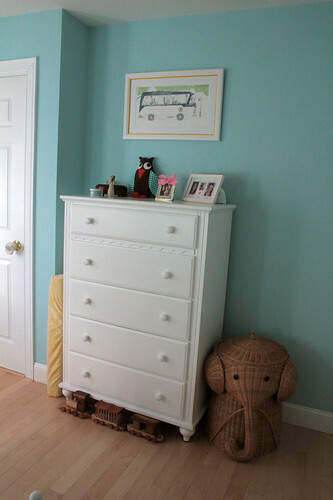 (Just like we'd done with Paige's dresser in her nursery). 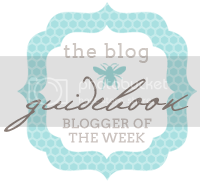 -The bamboo wooden mobile is from Petit Collage. -The owl print on canvas is also from Petit Collage. Not sure if they are selling it anymore, but they have lots of great choices for wall art! 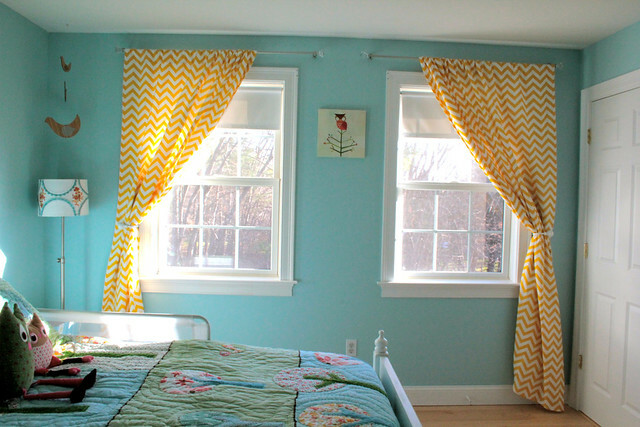 -The curtains in the yellow chevron pattern were from Windows By Melissa (she was super friendly and easy to work with!). 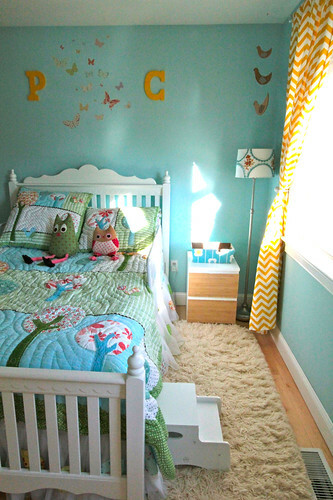 -The butterflies over the bed are removable and can be taken off and put back on over and over and over again. So easy! I love them. They came from Love Mae on Etsy. There's tons of product and great decals and ideas there. I even got Paige a cool paper doll decal from there...it's currently on the wall in my living room. -The letters came from Michael's craft store. They came in white, so I spray-painted them yellow gloss. Easy! -The rug is from her nursery; it had come from Crate and Barrel back in 2008-2009. It's a simple cream shag in size 4 x 6 feet. -P needs a little step stool to get into the bed; so we found a white one that has a lid that lifts for storage at Buy Buy Baby. -Her toddler bedrails also came from there. Paige's book nook is my favorite part of the room. 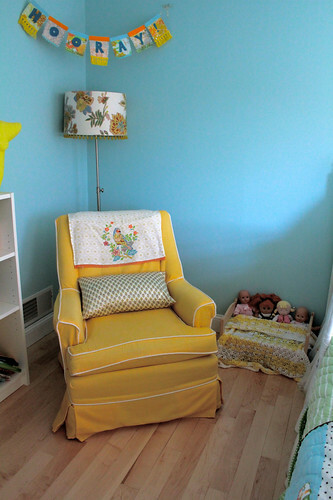 -Her yellow chair is a slipcover custom-made by Calico Corners. The chair is really a pea-green velvet number I found at the Salvation Army store for 9 bucks when I was in my early twenties. -The Hooray banner came from the shop called Nice on Etsy. I love it! It's how we felt in bringing Paige into the world. -The bookcase came from Ikea and I painted the back wall of it yellow. It got all scraped up, so I would probably line it with paper once it's all put together (if I were to do it over again). -The kitchen towel draped on the back of the chair is from Anthropologie circa early 2009. -The pillow on the chair came from West Elm in 2008. It was meant for our bedroom, but Paige kept bringing into her room again and again so I just leave it there now. Ha! We put Paige's little doll bed next to her own bed for now. She's still not really into playing with dolls yet. The doll bed was a steal from Ikea. The blanket was crocheted by my dear friend's mother for Paige when she was born. -The bed and dresser came from our local huge furniture chain called Jordan's Furniture. It was on sale as it was to be discontinued. I loved the scallop detail on both the bed and the dresser. -The elephant hamper came from Home Decorator's Collection. It's the medium sized one in the color honey. -The stuffed owl came from Modern Nursery. 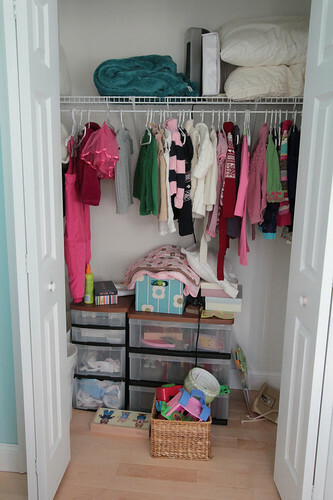 -You can see I store P's changing pad in the nook next to the dresser and wall. When I need to change her (potty training just can't happen right now) I throw the pad on the bed and go about our business. -The print above the dresser came from the esteemed Erin Stead, winner of the 2011 Caldecott Medal for her illustrations in the book A Sick Day for Amos McGee. (For anyone that doesn't know; that medal is basically the "Best Picture" Oscar for illustrators. Doesn't get bigger!) That book is a huge favorite around here; and these illustrations are my favorite from any book by far. She has offered a very limited selection of prints from the book for sale and I jumped at it. I had it framed at Michael's craft store. Paige chose the print she wanted and she loves it. I like that it's a real piece of art that holds monetary value as well as memories. Read more about Erin Stead (this was the first book she's ever illustrated!!!!) and her story here. 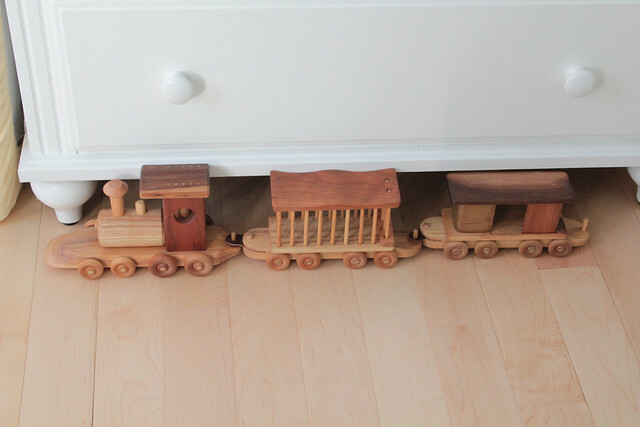 I'd be remiss if I didn't include a picture of Paige's beloved wooden train. Handmade, here! I hope you enjoyed your tour and that you like her space! I love playing in there with her. It's cozy and happy, and most important of all...she loves it! woahhh! lucky p! i think i want that for my room! I'm jealous of all your progress - my due date is only 3 weeks away and I feel like I've gotten nothing done with converting my 2 year olds room and working on the new baby's room. I'm still waiting for some nesting to kick in I guess, lol. Thanks for sharing! Love the colors and the new curtains. great room! cant wait to see it in upcoming magazine articles! its amazing! what is the paint color you used for this bedroom? 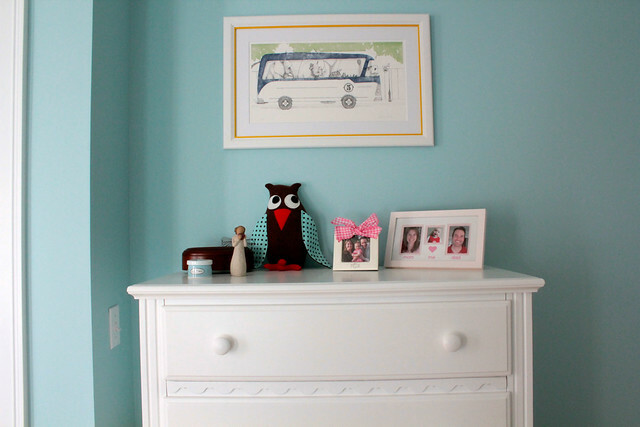 is it still Robin's Nest from Benjamin Moore from her Nursery? One last question promise!, which kind of paint of Benjamin moore did you use? the BEN?, AURA?, ECO Spec? Thanks!! Brenda; I honestly have no idea! We don't have the can anymore and the painting was done back in July/August. I'm sorry I'm not more help in that arena! oooh....gorgeousness. I especially love Paige's reading nook. The Anthro tea towel on the repurposed 9 buck chair is simply great. Love the bus print too. Thanks for letting us in and look around! (Did I miss where her bedspread is from? Looks like maybe Pottery Barn? 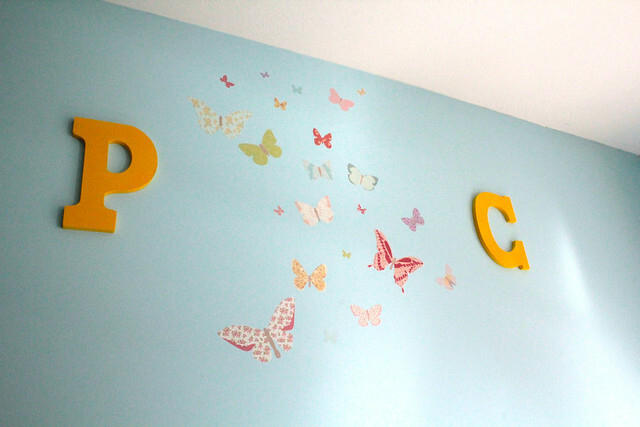 We got our wee one a whole nursery set that resembles P's from Pottery Barn...love P's!) Happy December from Vancouver! Hi - I know this is an older post, but hoping I can still find out where the bedspread is from. I don't think i see it listed. thanks! it's beautiful. The bedspread was from Pottery Barn Kids. Not sure if they still carry it, but it's worth a shot! I know they have lots of things, at least, that look similar! Good luck!